Happy Easter to everyone who is celebrating that holiday this weekend! Rabbits are the first thing I think about when Easter comes to mind, so I thought I’d talk about them today. Since rabbits are my favourite animal of all time, it always makes me happy to see representations of them in books, cards, plush toys, candies, and so many other places at this time of the year. The vast majority of the stories out there about rabbits are bedtime stories written for young children. I genuinely have no idea why that is the case. Today I tried to come up with as many examples as possible of books that were written for older audiences. No one is ever too old to like rabbits, and there are many different ways to write about this animal. I mean, I’ve been a proper adult for years now, but I still get irrationally excited whenever a rabbit is nearby. They’re such soft fluffy, and often hilariously stubborn little creatures. If not for my unfortunate allergy to them, I’d have at least two or three of them hopping around my house and getting into mischief right this minute. Nearly everyone has heard of Peter Rabbit. If you liked that story, you might really enjoy the author’s less widely known works, too. 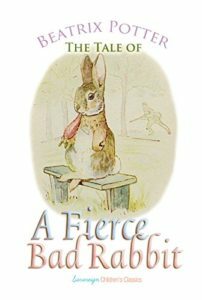 What I appreciated the most about The Tale of a Fierce Bad Rabbit was that all of the naughty things the rabbit did in it happened for a reason. He was a smart little creature who knew exactly what he was doing and why he was doing it. Make sure you have a full box of tissues ready to go ahead of time. This is a real tearjerker, but it’s also one of my favourite stories of all time. 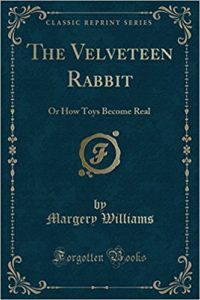 For anyone who hasn’t heard of it, it’s about a toy rabbit who was deeply loved by a little boy. After the boy was diagnosed with scarlet fever, all of the toys in his room were sent away to be burned to prevent the spread of that awful disease. What happened to the toy rabbit next is why I read this tale over and over again. This was a story I accidentally stumbled across at my local library a few weeks ago. 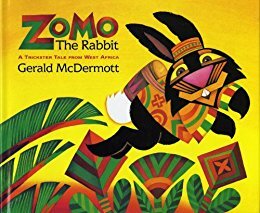 I’d never heard of the legend of Zomo the Rabbit before, but I loved seeing how he used his wits to outsmart creatures much larger and stronger than he was. 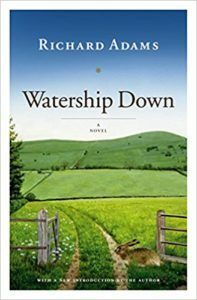 I know this isn’t the first time I’ve talked about Watership Down on a Saturday Seven post, but it simply had to be included in this week’s list. The bunnies in this story were courageous and kind. This was almost like a rabbit’s version of The Hobbit or some other epic adventure that required facing many dangers before the heroes had any hope at all of accomplishing their mission. Many years ago, there used to be a blog called “Disapproving Rabbits” that shared pictures of rabbits looking surly, annoyed, or like they disapproved of everything their humans were doing. That site sadly no longer exists, but this book is a collection of many of the photos that were featured on it back in the day. The empathy in this story was beautiful. Grief and loss are difficult subjects for many adults to talk about, so I loved the fact that the authors wrote something explaining those things to young children who are even more bewildered by them than us grown-ups are. This is a book that I’ve actually been trying to get ahold of for quite a while now, although I’ll almost certainly skip the section about how and why rabbits are slaughtered for human consumption. With that being said, learning more about the history, sociology, and folklore of rabbits appeals to me quite a bit in general. Have you ever had a pet rabbit? What is your favourite animal in general? Thanks for playing! I love rabbits and had one as a kid growing up (I received him at our town’s Easter egg hunt… didn’t win him, but the person who did never came to claim him…probably his mother didn’t like the idea…so the event planner asked me if I wanted him. My grandmother said she couldn’t say know when I looked at her with those pleading eyes. He lived happily in our backyard until I was in junior high). I’m so glad your rabbit had a long and happy life. I remember the Disapproving Rabbits blog! 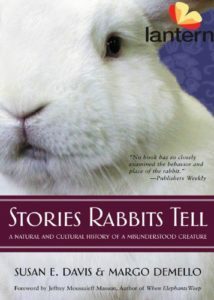 LOL… I’ve read a few of these, but the one called “The Rabbit Listened”, geez, I got teary eyed just looking at the cover! 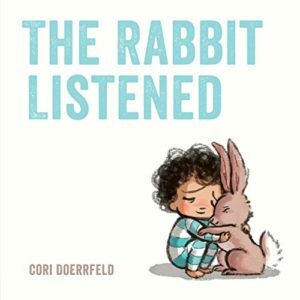 Yes, “The Rabbit Listened” definitely was a tearjerker. I loved Goodnight Moon, too. I thought it had rabbits, but now I’m second-guessing. Loved the Velveteen Rabbit, but doggone it made me cry. Good list! Thank you. I’d forgotten about Goodnight Moon! It looks like it does have a rabbit in it. Yes, The Velveteen Rabbit is a total tearjerker. Watership Down was the first thing I thought of when I saw your title. Loved that book! I must say that I’m tempted by Disapproving Rabbits! My Seven post is here – and I have a giveaway! Yes, Watership Down was a wonderful read. 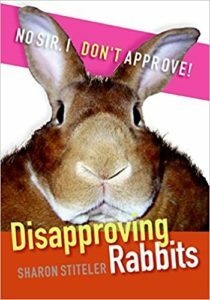 If you have a playful sense of humour, Disapproving Rabbits is a lot of fun, too. I’ve never had a rabbit, but I have occasionally played with one. They’re pretty impressive and SO soft. I haven’t heard of some of those titles, they sound very interesting. I do like cats, but I seem to be allergic to many of them, so I guess I’ll stick with dogs as my favorite! Belated Happy Easter! I’m allergic to cats, too. Dogs are wonderful creatures, although I’m sadly allergic to them as well. It’s nice to see people out on walks with their dogs, though. They often look very content together. Belated Happy Easter to you as well!